Looking for something to do? In Southwest Florida, the Suncoast Surfriders will hit the Treasure Island Beach at 10 a.m. for a beach cleanup, yoga and a surf and SUP event. What is yomping, you might ask? Ross is a former merchant marine who has done a lot of yomping in his days. The term is Royal Marines slang to describe a long-distance march carrying a full kit. Red tide is nothing new in Florida. The Karenia Brevis algae that causes red tide has been noted since the 1840s, but the annual blooms can be fed by coastal runoff when the bloom nears the coast after summer rains begin. Winds from the Gulf blow the red tide toxins onshore, causing respiratory discomfort for beachgoers and coastal residents, and killing fish and other sea life. The Florida Fish and Wildlife Conservation Commission reports that the current bloom continues in low to medium concentrations, with fish kills reported from Englewood and Boca Grande. Respiratory irritation has been reported from Boca Grande in Lee County and along Englewood and Venice-area beaches up to Lido Key. The Herald-Tribune reported that a “heavy” fish kill was observed June 8 at Siesta Key, home to the world-famous sugar-sand tourist destination that has been named the country’s No. 1 beach on two occasions. The first effects from the current bloom were reported in October 2017. Tourism is the state’s No. 1 industry with a record number of 33.2 million visitors reported in the first quarter of 2018, which was the largest quarter for visitation in Florida history. Most Florida tourists are unaware of red tide and the problems it can cause: itchy eyes, sore throat and an involuntary cough. For people with severe or chronic respiratory conditions, such as emphysema or asthma, red tide can cause serious illness. The organism can also cause illness if people eat shellfish contaminated with red tide. To find out more about red tide, read Mote Marine’s FAQ. 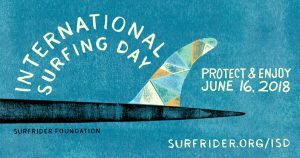 So before you hit the beach on International Surfing Day or any other day this summer, check these sites to find out if red tide is going to ruin your outing. Mote Marine’s Beach Conditions page. Pick a beach that is out of the zone, and enjoy. Remember to pack out all of your trash, and if you are able, try to find an additional three plastic items to haul off the beach. Spread awareness of ocean health and not fertilizer in your yards. Report fish kills or red tide to monitoring agencies. To report fish kills, contact the FWC Fish Kill Hotline at 800-636-0511 or submit a report online. 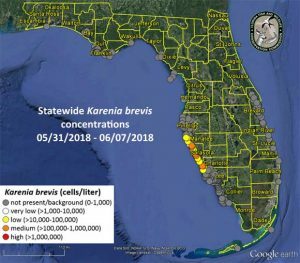 Reports from this hotline help FWC researchers track and better understand the impact of red tide in Florida. Visit Mote Marine Laboratory’s Beach Conditions page or call 941-232-2437 to get an up-to-date report on area beaches. Just say no to nitrogen: Observe Sarasota County’s Fertilizer Ordinance, which prohibits the use of any fertilizer containing nitrogen or phosphorus, runs from June 1 through Sept. 30. Volunteer to collect samples from along Florida’s coast. Join the FWC’s Fish and Wildlife Research’s Red Tide Offshore Monitoring Program or use the Volunteer SignUp Form. Monitor news reports of Lake Okeechobee discharges, which has fouled the water in estuaries on both on Florida’s west and east coasts. 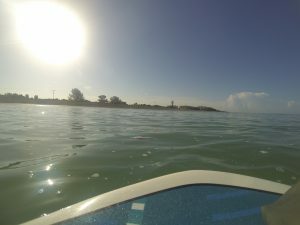 The Gulf water at tourist mecca Sanibel Island turned brown recently after a recent Lake O water release, according to news reports (link). And a longtime Florida fisherman said the Lake O releases have forced to leave her longtime home along the St. John’s River and the Indian River Lagoon and move inland to pursue her passion. Take a stand: Write and call your elected leaders to encourage them to stand up for the health of our area’s most precious natural resources, the Gulf of Mexico and its tributaries, including the Myakka, Peace and Caloosahatchee rivers. Vote: Support candidates who are committed to protecting the environment and hold them accountable. Allard PPC has worked for decades to protect and preserve our ocean playground, and we hope you’ll join us — for yourself and for future generations.